Aesculapius - God of health and medicine. - Roman God. Aesculapius is the God of health healing and medicine. 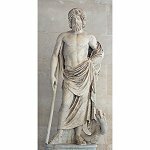 Home ¦ Divinity of the Day ¦ Roman Gods and Goddesses ¦ Aesculapius - God of health and medicine. Aesculapius - God of health and medicine. Aesculapius is the God of health, healing and medicine. He represents the healing aspect of the medical arts, his daughters are also associated with healing, recovery and medicine. He was associated with the Roman/Etruscan god Vediovis. The rod of Asclepius, a snake-entwined staff, remains a symbol of medicine today. There is a Temple of Asclepius at Epidaurus in north-eastern Peloponnese.